Alright... 2nd time on the kite and I just broke my height record in comparatively low wind... BOOM! On FS 12M in 19 knots gusting to 21; with wave kicker made it slightly over 30 ft. I could have handled a lot more wind, maybe 25 knots? To compare, my max jump on the LF Envy 12 was 22 ft, almost a 50% improvement. My previous record was 28 ft on a LF Envy 7M in 30-35 knots. Can't wait for big wind! - Kite infinitely more responsive. - Window not as large a bow kite, but still plenty large. - I couldn't get it to stall! I had some decent wipe outs where my Envy would have been toast, but the FS just sat there waiting for me. - Harder to relaunch, but that goes with a C. Not bad after a couple times. First time on the FS09 I broke my height record, 37.5 feet in 25g30. Prior record (other than FS12) was 28 ft on Liquid Force NV07 in 30G35. That's basically 35% more air in 20% less wind. Ridiculous. It did stall once, but completely my fault, swung way underneath and landed in water. Took a couple seconds to pop it back out of water. I had it at 9 PSI, I recommend that in higher wind days. Looks nice, got to try the FS. Looking at some videos it seems to loop ok too, though a bit pivoty on some. 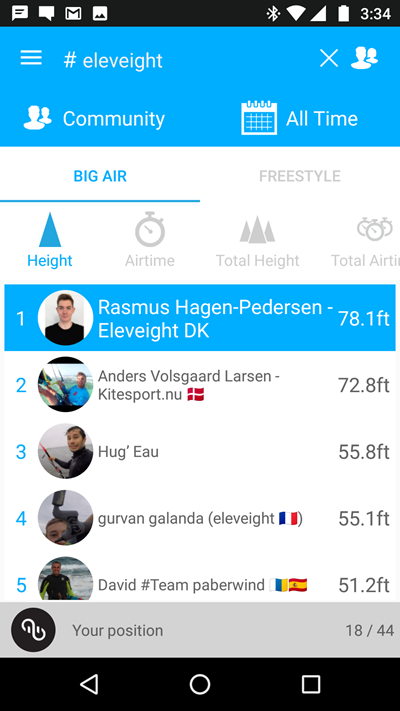 Yes Both Rasmus and Anders are using Eleveight FS. does the FS in 10m work well for heavier riders? I am around 95KGs. Looking to buy one for boosting and kiteloops. I don't see why it wouldn't work for heavier riders? I am not heavy but I see no reason why not. When this kite is loaded, it is extremely exciting. Explosive jumps and loops like a dream. My personal best is 62ft on the 10m. Just try one if you get a chance.